The HK lighting fair is vested with many years of experience and expertize in organizing trade exhibitions in the lighting industry. It is reputed internationally for its outstanding performance in helping investors explore business opportunities. The Hong Kong International Lighting Fair normally includes all manner of lighting such as LED & green lighting, commercial lighting, advertising lighting, household and all other types of lighting; The lighting fair also accommodates lighting accessories, parts & components’ exhibition. The trade exhibitions have been providing us with the unique platform where both exhibitors and buyers explore business opportunities. The HK lighting fair is world-class events that accommodate buyers and exhibitors from different countries and regions converge. The venue is a comfortable and convenient place that offers a perfect environment where exhibitors and buyers negotiate business, exchange the latest market intelligence, and establish business contacts. ShineLong has been participating in the Hong Kong International Lighting Fair for several years now. Our primary goals for attending the HK fair is to raise market recognition and introduce the merits of our latest technologies. The HK lighting fair is one of the most influential lighting fairs in the whole of Asia since it offers an important launch pad for our new products. At this year’s fair, we intend to introduce the second generation of our LED products. The new LED products we have been launching at the fair have been attracting strong interest from buyers all over the region. At the Hong Kong(HK) Lighting Fair, we have met with new clients from the Chinese, EU, India, Southeast Asia, and the US. It is, for this reason, that we want to expand our boundaries and explore business opportunities in the United States and AU, and we expect to meet you there next year. ShineLong is one of the largest suppliers of LED lamps in Asia. Our mission has always been providing the mass market with our high-end LED products at reasonable and affordable prices. 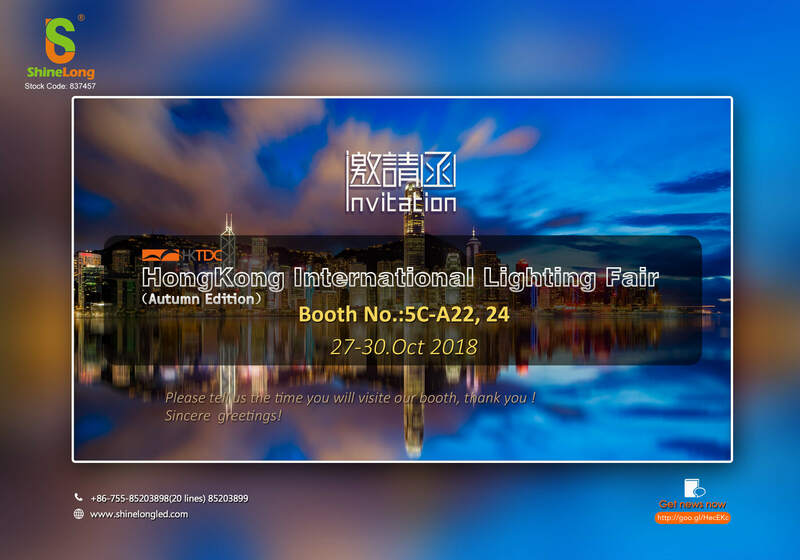 ShineLong has been taking part in the Autumn Lighting Fair for many years because it has always given us the best platform for us to showcase the new products we intend to launch for the coming year to customers. The Lighting Fair is a perfect place for us to meet with buyers from Asia, Australia, Europe, South America, and the US. It also gives our company an excellent opportunity to see the latest trends and developments in the lighting industry. We will maintain our presence at the fair. ShineLong is a long-term supporter of the HK lighting fair. It is important that we maintain our presence at this fair because it provides an efficient channel for us to make our brand image stronger and increase awareness and to get new clients. The business atmosphere at the fair has been magnificent.